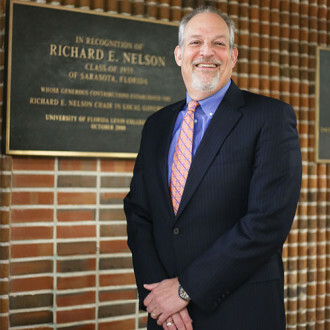 Michael Allan Wolf joined the faculty of the University of Florida Levin College of Law in August, 2003, as the first occupant of the Richard E. Nelson Chair in Local Government Law. Professor Wolf has been teaching and writing for more than three decades in the areas of land-use planning, property, local government, constitutional, environmental, and urban revitalization law; and legal and constitutional history. He earned his B.A. degree from Emory University, his J.D. degree from the Georgetown University Law Center, and his A.M. (history) and Ph.D. (History of American Civilization) degrees from Harvard University. Professor Wolf, who was Professor of Law and History at the University of Richmond, held his first law teaching appointment at Oklahoma City University and has also served as a visiting professor, first at the University of Richmond, then at American University. Since 2000, Professor Wolf has been the General Editor of Powell on Real Property (17 volumes), the most prominent treatise in the area that is regularly cited by state and federal courts. Other recent books include Land Use Law (with Daniel R. Mandelker, 2015-), The Supreme Court and the Environment: The Reluctant Protector (2012), Land Use Planning and the Environment: A Casebook (with Charles M. Haar, 2010), Powell on Real Property: Michael Allan Wolf Desk Edition (a one-volume abridgement of the treatise, 2009), The Zoning of America: Euclid v. Ambler (2008), and Strategies for Environmental Success in an Uncertain Judicial Climate (editor and contributor, 2005). His writings have also appeared in a wide variety of law and law-related journals (including the Harvard Law Review, Michigan Law Review, and Fordham Law Review), many of them contributions to symposia on topics in land-use regulation, environmental law, eminent domain, and regulatory takings. His commentaries have been featured in national newspapers and on National Public Radio.